Comprehensive gadget insurance for your favourite devices, at great prices, with an experienced in-house customer care team. Whatever your device, our specialist gadget insurance covers everything from the most popular brands on the market to lesser known manufacturers. Choose your level of cover from our two comprehensive policies: Plus or Premium. You’re guaranteed to receive a great service, supported by our friendly, UK-based customer care team. Unlike many of our competitors, Theft and Loss Cover is included as standard in all our policies. If your gadget goes walkabout, we’ve got you covered. Even the latest and most sophisticated gadgets aren’t invincible. Luckily, our policies offer Accidental Damage and Liquid Damage cover, to get your device back in your hands as soon as possible. These days, we take our devices everywhere – if something should happen to your beloved gadget while you’re abroad, our Worldwide Cover means you won’t be out of pocket. Gadgets usually come with chargers, headphones, cases and more, which is why we’re proud to offer Accessory Cover should your items get damaged or stolen. Accidents happen. But when they happen to your gadget, our comprehensive cover gives you peace of mind and financial reassurance. Dropped or knocked your gadget and the screen is cracked or not working properly? Don’t worry, we will get it repaired! We offer a replacement gadget and cover for unauthorised calls when your device is taken from you. We can help you protect the accessories that allow you to enjoy your gadget - like headphones, chargers and cases - if they get damaged or stolen. We know you love to take your gadgets with you wherever you go, so if that’s abroad, you’ll be pleased to know our insurance includes unlimited worldwide cover. Airtime abuse can be a concern if your device gets stolen. Our gadget insurance covers the cost of unauthorised calls made following the theft of your phone or tablet. We all try our best to protect our beloved gadgets, but unfortunately accidents can still occur. Whether you accidentally smash your phone, lose your tablet on holiday, or your device is stolen at a concert, it’s a huge inconvenience that can leave you out of pocket. That’s where we come in. 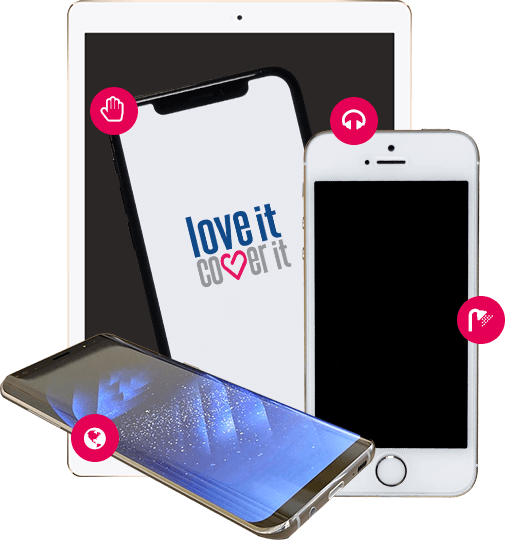 loveit coverit have been specialist gadget insurers for almost 30 years; you can feel safe in the knowledge that your device is covered by one of the leading gadget insurance firms in the field. We truly understand the frustration that occurs when something happens to your phone or tablet, and we aim to repair or replace your device as soon as possible. Purchasing a gadget insurance policy is quick and simple – we pride ourselves on keeping our policies jargon-free. Unlike many of our competitors, our claims procedure is processed entirely in-house. Our knowledge and expertise will ensure your gadgets are processed to meet your high standards; it’s no surprise that loveit coverit has a 5-star rating on the review site Defaqto. With loveit coverit’s gadget insurance policies, you can expect a comprehensive service for a fantastic price. Our phone and tablet cover offers great benefits including unlimited claims and a 12-month warranty on repairs and replacements, so you can relax knowing that your device is protected anywhere and anytime. We’ve been in the insurance industry since mobile phones were the size of bricks, so you can trust your device in the hands of an experienced company. As a specialist gadget insurer, we pride ourselves on offering a comprehensive service at competitive prices. Our comprehensive and affordable policies are backed by number 1 leading, global insurer provider AXA, together offering customers high-quality and high-value protection for their devices. We’re always happy to help, and incredibly proud to offer an end-to-end service. All repairs and replacements are issued from our own repairers, supported by our friendly UK-based customer care team. What’s more, we’re fully regulated by the FCA. We won’t tie you down with a 12 or 18-month contract. With loveit coverit your policy is flexible and can be cancelled at any time, subject to terms and conditions. You’ll still enjoy the full benefits of your chosen policy plan, with no hidden surprises. Provided you haven’t made a claim, you’ll receive a full refund if you cancel your policy within 14 days of policy the start date. Our comprehensive service includes a two-week grace period, so you won’t be out of pocket if you change your mind. Many of our competitors only allow you to make one or two claims each year. With loveit coverit, there’s no limit on the number of claims, regardless of whether it’s an accidental damage, theft, or loss claim. No matter what happens, we’ve got you covered.